Engage Learning is staffed and supported by over a dozen field professionals. We are proud and honored to work with teachers, designers, makers, engineers, and architects who have a passion for teaching students how to solve real-world problems. They are some of the most encouraging, inspiring, fun-loving people you’ll meet! Say hello to Megan: artist, sculptor, super-creative mom, part-time Engage coach. 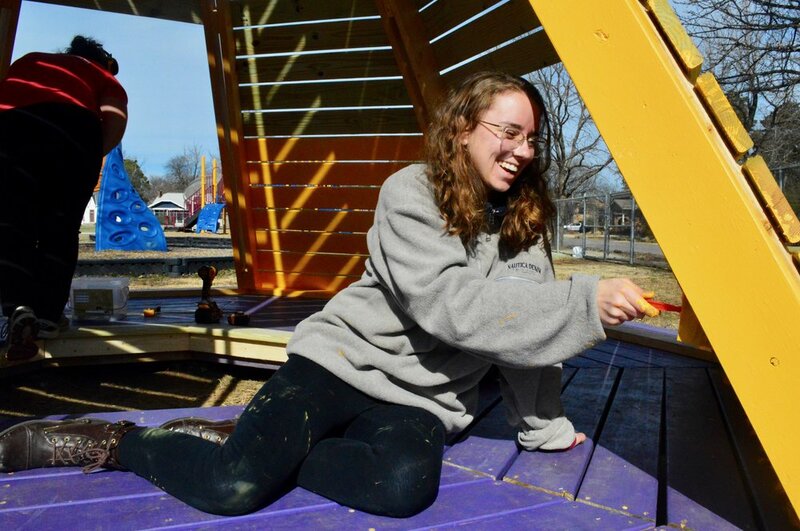 Relatively new to the crew, she has already been a huge part of the Lincoln Elementary Playground Project in Norman. Engage coaches are crazy-talented makers and fearless doers who are out to empower the maker imagination in Oklahoma. Thrilled to have you on the team, Megan! Visionary, innovator, dad joke extraordinaire - Bart is the Executive Director of Engage Learning. Prior to founding Engage in 2016, Bart taught middle and high school students in the Duke Talent Identification Program (Duke TIP) as a Ph.D. student and Fellow at Duke University. Now, Bart spends his time empowering students to discover new passions through hands-on learning experiences. Thanks for your vision, Bart. Here's Alex: OU Architecture grad, full-time Engage coach, and point on the Norman High School Tiny House Project. He’s a super-talented maker, fearless doer, and loves creating compelling and authentic learning opportunities for students. Thanks for being who you are, Alex. Marie is a videographer and painter who brings unique value to every project she touches. Pictured here working on the student-designed "Chill Volcano" at Lincoln Elementary School in Norman, Marie provides creative insight for every team she works with. Thank you, Marie, for sharing your talents and joy with the Engage team and our students! Engage Learning was founded in 2016. Since our first project in August 2016, we have completed 15 projects with students from the Norman and Oklahoma City areas. Our projects happen all year round, with 2 week long summer projects and 10 week long semester projects. Over 150 students have participated in Engage Learning projects, and many of them have returned for multiple projects. The problems which students often seek to solve on projects revolve around solving real-world problems. Topics have ranged from solar-powered community structures to crazy fun natural playground structures.